Our diaper cakes are the creative imagination of transforming boring disposable diapers into an attractive baby shower centrepiece or an excellent practical gift idea to welcome the new baby and delight the new parents. 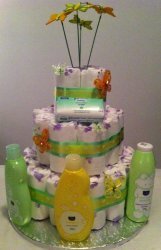 Diaper cakes are "cakes" that are made up of usable baby necessities (diapers and baby products) put together to resemble a tiered cake then decorated with various items of baby clothing, baby care products and trimmings. All the cakes are creatively hand crafted and are themed according to client requirements. We use good quality nappies and accessories.